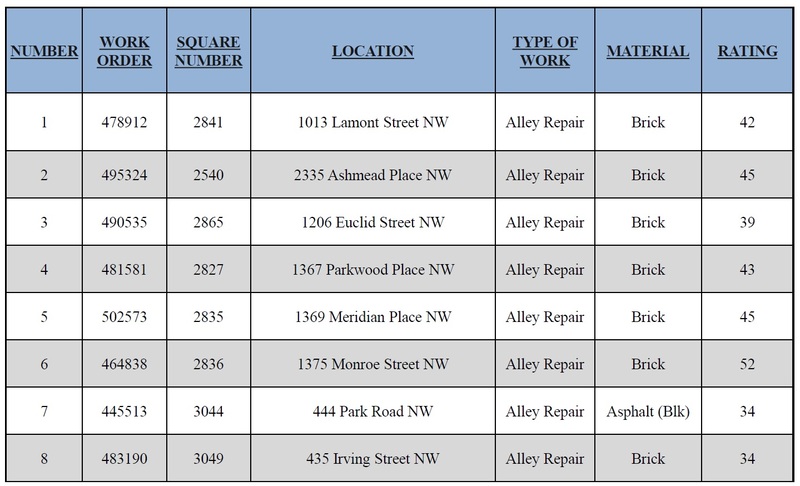 More Neighborhood Alleys To Be Repaired in AlleyPalooza 3 | Park View, D.C. In this year’s AlleyPalooza 3, at least two more alley’s in the neighborhood have been identified for renovation. 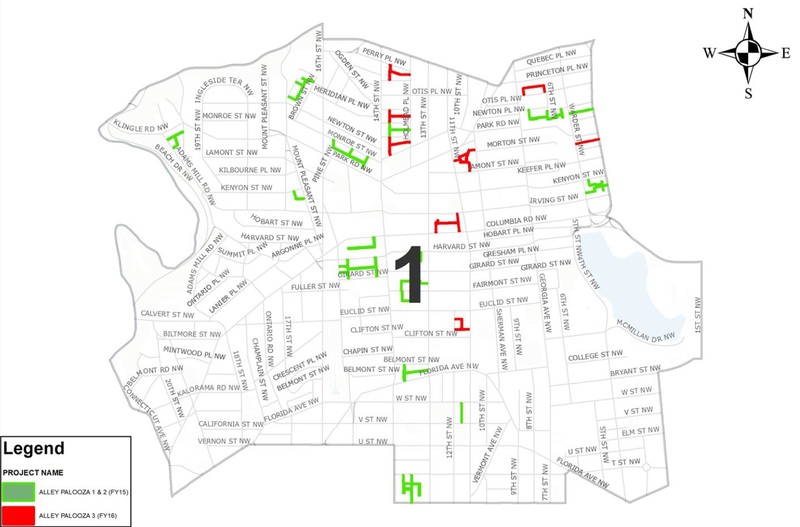 AlleyPalooza 3’s goal is to provide construction, improvement and repairs to 8 alleys in each of the 8 wards in 12 weeks for a total of 64 alleys. The cost to do this is approximately $10.5 million. 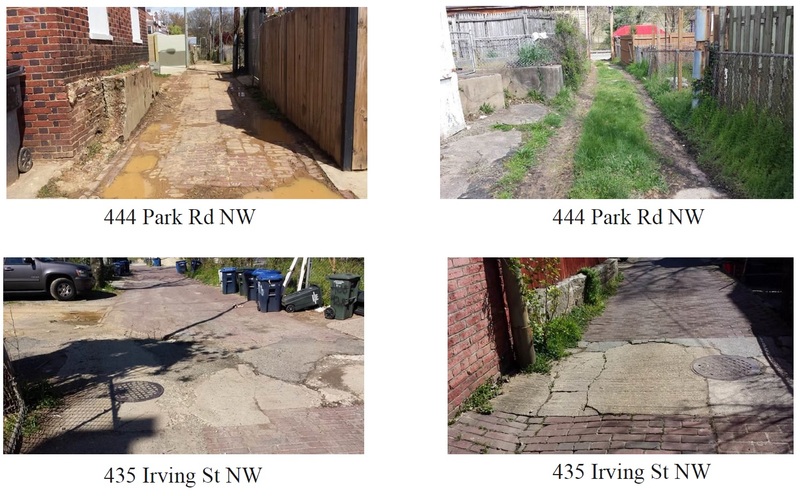 The alley repair campaign is Mayor Bowser’s summer program to reconstruct and repair alleys in all eight wards across the city. I know that there are a lot of factors that go into selecting the alleys for inclusion each year, but want to give a shout out to Commissioner Rashida Brown, the Luray-Warder Neighborhood Association’s Audra Grant, and Ward 1 MOCR Gabriel Rojo (and I’m sure there are others) for taking the time to walk alleys in the southern part of the neighborhood, identify alleys, and advocate on behalf of their repair. The slides below are from the slide deck listing the alleys to be repaired in Ward 1. This entry was posted on April 28, 2016 at 7:01 am and is filed under alleys, Restoration repair and maintenance. You can subscribe via RSS 2.0 feed to this post's comments. Extremely excited to see the alley between Luray Pl. and Park Rd. Will be getting a facelift, but is there a reason that it will be paved in black asphalt rather than brick like all the others? I live on Luray Pl. and know that the alley is very narrow and is used more as a pedestrian walkway and bikeway than for car traffic. Also, you can see in the two photos that the alley was once paved in brick. It would be a shame to lose that part of the history of the neighborhood. I know I’m not the only neighbor on this block that would prefer to have the alley paved in brick. How was this decision made? Is there any recourse for us concerned neighbors to take to get this changed? I thought it would be cool if they just followed natures lead, and made this a grass alley. Take out the brick and put in grass that the city would maintain. Aren’t we trying to have more permeable ground. But either way black assault sounds horrible. I am not sure who wants that, or why it would be seen as an improvement. Wondering how we can get on this list — the alley on the 700 block between Columbia and Sherman and Georgia Ave is MUCH worse! !